A solid team performance saw Lewes return from Kent with their first point of the season after a hard-fought 0-0 draw with Tonbridge Angels, reports Tom Harper. Darren Freeman made two changes to the side that lost their opening game of the season at home to Carshalton Athletic, with Michael Dome-Bemwin and Luke Blewden replacing Bouwe Bosma and Nassim Dukali in the starting line-up. In a first half of few clear-cut chances for either side, the best of the opportunities fell to Lewes, who saw Omarr Lawson mis-control a Leon Redwood cutback in front of goal after good play down the left. Tonbridge enjoyed a spell of sustained pressure towards the end of the half, but were unable to test Lewis Carey. 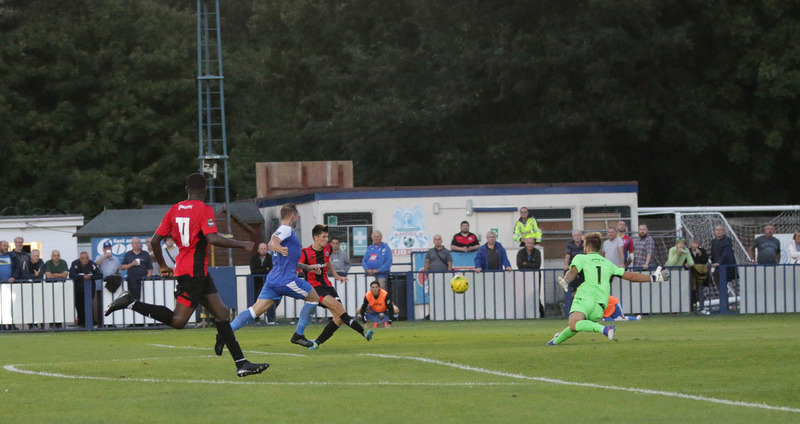 The best chance of the half came for Lewes just before the break, as Ronnie Conlon latched onto a Jonte Smith through-ball but saw his effort kept out by the face of Jonathan Henly in the Tonbridge goal. The hosts started the second half brightly, and saw Craig Stone fire just wide from close range after the Rooks had been unable to clear a deep corner. Lewes were enjoying plenty of possession themselves though, and came close to taking the lead twice in quick succession, as Luke Blewden was just unable to get on the end of a Smith flick-on at the far post, before Conlon missed the target with just Henly to beat minutes later. The Rooks had another good chance to go ahead again just after the hour mark, but Smith was only able to shoot straight at Henly from the edge of the area after an incisive counter-attack. Tonbridge enjoyed arguably their best spell heading into the final 20 minutes of the game, with Carey forced into a smart save to help a close-range Alex Read header over the bar. The resulting corner from the right picked out an unmarked Sonny Miles in front of goal, but he could only direct his header just wide. The hosts were continuing to press heading into the final ten minutes, as James Hammond made a superb last-ditch block to deny Tom Beere after Liam King had beaten Stacey Freeman to a long ball forward and cut the ball back from the right. Lewes continued to pose a threat on the counter, with Henly making a smart save to push a 25-yard strike from Lawson round the post. The final opportunity of the game fell to Tonbridge, but they were once again denied by superb defending from Hammond, who somehow managed to clear a curling effort from King off the line and round the far post with Carey beaten. This was a well-deserved point for Lewes, who defended well throughout the game and could easily have won on another day after managing to create several presentable opportunities over the course of the game. Darren was obviously very happy with the point when he spoke to Barry Collins post-match. Pictures from the game, thanks to the magic lens of James Boyes, here. Next up for the Rooks is a trip to Dorking Wanderers on Saturday, kick-off at 3pm. Tonbridge Angels: Henly, Folkes, Parter, Stone, Miles, Lee (Whitnell 46), Small (Ramaden 37), Parkinson, Read (King 78), Beere, Turner. Unused Subs: Adonis-Taylor, L. Smith. Lewes: Carey, Brinkhurst, Redwood, Hammond, Chappell, Freeman, Blewden (Reed 67), Dome-Bemwin, Conlon, J. Smith (Medlock 75), Lawson. Unused Subs: Cotton, Dukali, Bosma.